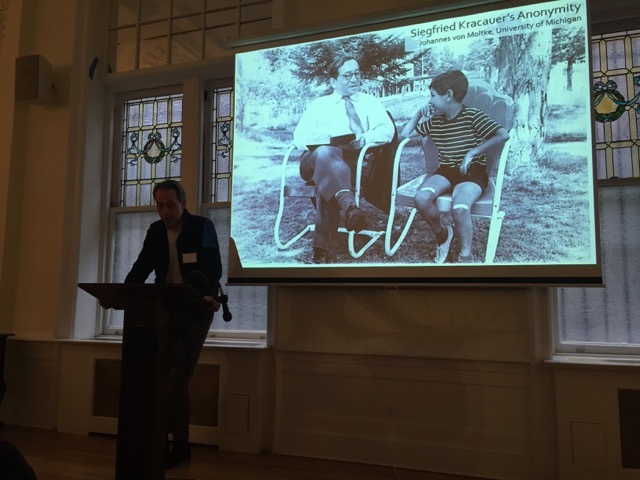 Transatlantic Theory Transfer: Missed Encounters?, a wonderful conference held last weekend at Columbia University’s Deutsches Haus, explored the American reception of key twentieth-century German thinkers. So capacious a theme may seem untenable at first, and so indeed it proved in the best possible way. Every paper called the conference title into question. Anna Kinder and Joe Paul Kroll began by suggesting how the extraordinarily messy processes of circulation and reception could substitute for clean conceptual ‘transfers.’ These former include an author’s reputation, initial sales figures, publishers’ stature and funds, the sale of foreign rights, government assistance schemes, copyright law, available translators, informal intellectual connections, formal academic networks and US teaching positions, citations and reviews in journals, varying audience interests, and—it may finally turn out—something inherently resistant or hard to assimilate in texts wherever foreign audiences are concerned. Style and intellectual difficulty as such do not quite catch at that last possibility. To borrow from Tim Parks, could it be that cultural specificity and baggage limit theory’s range just as much as they do fiction, say? And do certain ideas and ways of thinking wholly frustrate effort translation? As per Philipp Felsch and Robert Zwarg, ‘theory’ considered as a genre here opens certain doors while closing others. How does one consider theory as an export or place it on an academic map? How does one narrow it to a disciple or a department, let alone go about teaching it in the university or using it as a means towards social change (as one exhausting debate after another from 1968 onward in such journals as Telos insist)? Moreover, just how far each author identified their writing as ‘theory’—even those within the famous publishing phenomenon of the “Suhrkamp Culture” (as George Steiner termed it)—remains an open question, even if a ready definition could be derived from the ‘theory’ shelves of college bookstores. It may even be that theoretical texts meet wholly different expectations and needs among readers, say social and political ones as Dagmar Herzog reasons happened with the psychoanalyst Alexander Mitscherlich (an eclectic or even incoherent thinker) among the German and American New Left as well as among student movements. ‘Missed’ turns out to be misleading. So too does ‘encounters’ in the briefer or more climactic sense. Figures such as Gershom Scholem, Siegfried Kracauer, Hans Blumenberg, Reinhart Koselleck, Niklas Luhmann, Mitscherlich, Friedrich Kittler, and Alexander Kluge all indeed found interest among certain groups of readers. Yet this happened belatedly and in unexpected quarters just as these thinkers also failed to gain larger traction in America. Their great unspoken counterparts would be the figures associated with the Frankfurt School, including Walter Benjamin, and then ‘obliquely’ theoretical figures such as Max Weber. Wholly ‘missed’ receptions occurred much more rarely, though as Ernst Bloch’s publisher (the great Siegfried Unseld) conceded, they do happen. Much more interesting and perhaps even common were overlapping, diffused, partial, and blocked receptions. Hence in Scholem’s case, as Yaacob Dweck argues, it might be that a popular reception threatened to overwhelm a strictly academic reception. As Johannes von Moltke suggests in situating Kracauer’s readers, influence can also be so variously pervasive as to become invisible. The failure of an ‘instrumental reception’ can doom a thinker to smaller historical and philosophical readers, as William Rasch believes became the case for Luhmann once American sociologists gave up on what (even admirers will admit) is pretty turgid prose. And ‘homegrown’ thinkers like David Riesman or the so-called ‘Cambridge School’ of historians can present such strong affinities to German theorists like Mitscherlich and Koselleck that the latter (fairly or quite the opposite) never gain a foothold. Someone beat them to some of the punches. Similarly, only parts of different œuvres found ready audiences on political, disciplinary, and pedagogical grounds. According to Stefan-Ludwig Hoffmann, Koselleck’s late work garnered relatively less attention than his early studies given how neatly the latter slotted into Cold War categories. Strongly-marked early, middle, and late career stages stretched Kittler between media, communication, and German studies as his commentator and translator Geoffrey Winthrop-Young finds. And for Paul Fleming, another scholar-translator, the lack of a ready “hook,” exemplary methodological statements, introductory texts, or full translations (e.g. of Latin passages, &c.) keep Blumenberg from both undergraduate and graduate syllabi. Finally, temporality further muddies the picture as concerns de- and re-canonization (just think of used books’ circulation), waxing reputations in America and waning ones in German (and vice-versa), and the sheer speed and availability of good translations. 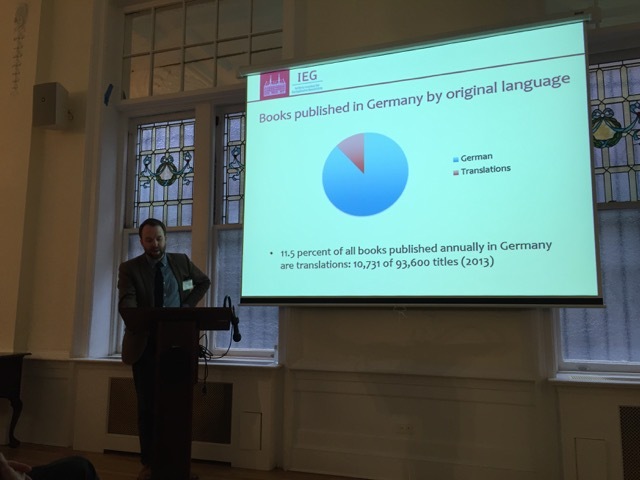 Unsung translator heroes emerge (such as Fleming and Winthrop-Young) as do such editors as Thomas McCarthy of the MIT Press series Studies in Contemporary German Thought. And indeed, several instances of retranslated works or books translated decades after their initial appearance undercut any notion of a flash-in-the-pan trend. One here can also consider a critical interregnum, say regarding an unsettled posthumous status in Kittler’s case or—as Devin Fore, Kluge’s American editor, contends—a strange moment before canonization could or even should occur. Neither ‘missed’ nor ‘encounters’ quite work. ‘Transatlantic’ fails as well. The incontestable prominence of French theorists drawing on Heidegger, Nietzsche, and other German thinkers makes this a triangular affair rather than a one-way crossing. Similarly, reputations made in the US cross back to Europe and—quite often—migrate south to the Latin American world and elsewhere. Any sense of a clean map or linear narrative explodes. What then remains to say? Each figure discussed at the conference encountered unique obstacles in finding an American readership. Yet there were also common challenges, as suggested above, and these in turn imply new directions for twentieth century intellectual history. Social and political history as well as the history of publishing, of the book, and even of reading—as Marxist study groups shaded into looser book clubs, for instance—perfectly complement the history of ideas in the postwar period. As far as reception and circulation go, new figures, subjects, and periodizations will emerge in the latter field, now an increasingly and truly global history leading right to the present moment. The author would like to thank all the participants who granted permission to take their photos (whether used here or not). Wonderful, rich and provocative post: clearly a great conference. Also very good on these questions are Joshua Derman’s 2012 book on Weber and Ulrich Raulff’s spectacular memoir in the form of Rezeptionsgeschichte, Wiedersehen mit den Siebzigern: Die wilden Jahre des Lesens, 2014. Many thanks, Tony! It’s not easy giving full justice to all the presenters, but it really was such an interesting conference that I had to give it a try. And all us twentieth-century people can’t let early modernists have all the fun with reception …. It also looks like I have two new books to add to my list as well! I’ll only add that everyone at the conference seemed to have just read and loved Philipp Felsch’s “Der lange Sommer der Theorie: Geschichte einer Revolte” (C.H. Beck, 2015), and I really, really enjoyed F.C. Delius’s “Als die Bücher noch geholfen haben: Biografische Skizzen” (Rowohlt, 2012). Then again, I also always fall for books about books. I’ve read the Delius, which is very cool indeed. Felsch looks like a trip to amazon.de for me, Thanks! Can’t vouch for the Felsch yet, but super-impressive in person! And I can’t wait to get to the Derman and Raulff, too ….